Andy, I have a new rig which has USB 3 onboard so I’m not using this card anymore but sleep had never been an issue back then. 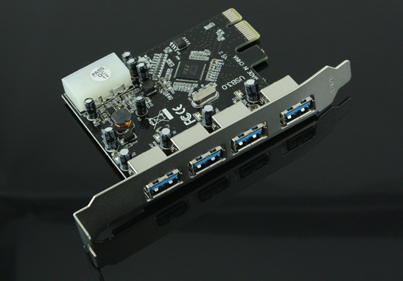 Does the system sleep properly with this USB card? I also bought a PCIe USB 3.0 based on Renesas Controller from Amazon for £7.68 for my Hackintosh – the card worked flawlessly and OOB on Xubuntu 14 and Windows 8.1. After reading your post I tried the Kext included in MultiBeast which worked like a charm! Just “cloned” the OS X installation of 10.09GB in under 6 minutes. @ Alex – The speeds are marvelous it beats all usb firewire esata …. make em look like crap. lol! The Hackintosh is an intresting system bought in existence on Intel systems. Leaves me totally clueless when hatching plot to install a hardware. But I keep trying to understand it as much as possible. Now asking about its performance. Did work for few days fairly well with 100 GB transferred in an hour. But today as I happen to connect Seagate portable hdd and it gave up. The system was frozen for long and after booting up it gave a long code of error which I did not understand…. Could somebody help me troubleshoot to know if driver is behaving weirdly or is it the hardware ….help is appreciated. what about sleep? does your mac sleep?